Few scholars have suggested that this night is Shabe Barat. 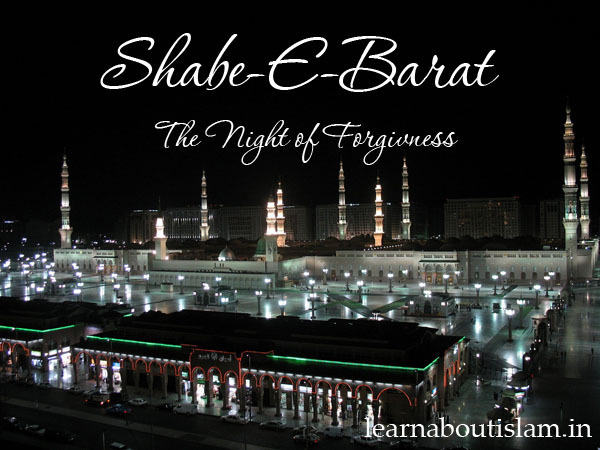 Shabe Barat is also called Night of Forgiveness. On the night of Shabe Barat, Allah Ta’ala Forgives all his servants on this earth. On 13th Night, Jibrail Alahisalam comes to Prophet Muhammad Sallahu Alaihi wasalam and informs that Allah has given Rights to forgive 1/3rd of the people from his Ummat. Allah's Messenger asks what about others. Jibrail Alahisalam says He doesn't know. On 14th Night Jibrail Alahisalam comes to Prophet Muhammad Sallahu Alaihi wasalam and informs that Allah has given Rights to forgive 2/3rd of the people from his Ummat. Allah's Messenger again asks what about others. Jibrail Alahisalam replies He doesn't know. And finally on 15th Night Jibrail Alahisalam comes to Prophet Muhammad Sallahu Alaihi wasalam and informs that Allah has given Rights to forgive 2/3rd of the people from his Ummat. 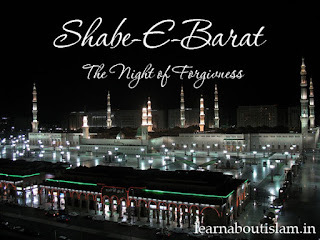 There are many merits of Shabaan, especially the 15th of Shabaan, which is known as Shab-e-Baraat or Lailatul Baraat, meaning the Night of Absolution. Shab-e-Baraat is a vessel for Mercy, Blessing, Benefit, Pardon and Forgiveness that descends upon the people of the earth. On this great night, Allah Ta’ala descends to the first heaven and proclaims, “Is there anyone who seeks forgiveness so that I may forgive him? Is there anyone who seeks sustenance so that I may grant him sustenance? Is there anyone who seeks freedom from his problems so that I may remove his problems?” This announcement continues until the break of dawn. Rasoolullah (Sallallahu Alaihi Wasallam) has said, “On the night of the middle of Shabaan, Allah Ta’ala descends to the heaven of this lower world and forgives every Muslim, except a mushrik (one who associates partners with Allah Ta’ala), the bearer of malice, the breaker of family ties, the adulterer, the miser, the one who is disobedient to his parents and the one who consumes alcohol. He (Sallallahu Alaihi Wasallam) has also stated that during this night Allah Ta’ala opens 300 doors of Mercy unto his servants and that the slaves of Allah Ta’ala are emancipated from the fire of hell, as numerous as the hairs on the flocks of the tribe of Bani Kalb. Allah Ta’ala states in the Holy Qur’an, “Therein all matters of wisdom are sorted out for Decree.” [Surah 44, Verse 4]. This Aayat refers to Shab-e-Baraat and it is stated in Tafseer Noorul Irfaan that on this great night, the entire year’s program of sustenance, death, life, honour and disgrace, in short every affair of man is listed from the Divine Tablet and handed over to the angels of each area on the earth in the form of a book. For example the Angel of Death is given a list of the names of those who would be dying in the coming year. After Maghrib Salaah 6 rakaats of Nafl Salaah should be read as three sets of two rakaats. Before the first 2 rakaats, make Dua to receive a long life through the barkat of those 2 rakaats. For the second set make Dua to be saved from all types of problems and for the third set make Dua for Allah Ta’ala not to make you needy of anyone besides Him. After each set of rakaats, recite Surah Yaseen once, Surah Ikhlaas 21 times and thereafter Dua-e-Nisfe Shabaan. One should also try to fast on the 15th of Shabaan as this is the Sunnah of Rasoolullah (Sallallahu Alaihi Wasallam). It is also better to fast both on the 14th and 15th (if possible) so that one would enter the blessed night of Shab-e-Baraat in a state of fasting. One should also try to visit the Qabarastan (graveyard) to make Dua of Maghfirat (Forgiveness) for the deceased, as this is the Sunnah of our beloved Rasool (Sallallahu Alaihi Wasallam).